Sometimes the most interesting movies come from the most unlikely and surprising teams. 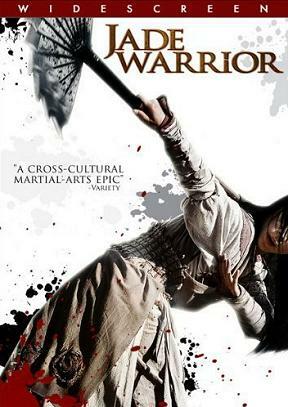 Jade Warrior is a Finnish-Chinese production that mixes an old Finnish poem with Chinese martial arts fantasy. In old times, the few who could write did not write “stories” or “books”, they wrote what we would call poems or verses. Beowulf is perhaps the most famous example, but in Finland they have the hero epic Kalevala, which consists of 50 songs and nearly 23.000 verses. The epic has been sung for many centuries, but was written down in the mid 1800s and has an important place in Finnish history and culture. No wonder then, that when the Finns wanted to make a fantasy movie, they would use Kalevala as the basis, resulting in the first ever Finnish film to be released in Chinese theatres. The story in Jade Warrior (original title; Jade Soturi) is about a Finnish blacksmith, Kai, whose girlfriend breaks up with him and tries to sell parts of his collection of Asian objects, including a decorated metallic box that includes ashes which turns out to be the key to open up a portal to Kai’s past, when he was a halfbreed Finnish-Chinese warrior who fought a Chinese demon. The story goes on in two parallell worlds, or two parallell times, and you better follow everything closely, or else you’ll loose track of what happens! Jade Warrior is not only a very talky movie, it also blends the present with the past and things are influencing eachother and linked together in ways that at times are rather confusing. I am sure director Annila and his co-writers kneaded the script over and over again to make it fit the story, but somewhere the flow of the narrative was lost, and in stead of conveying a good idea, nice scenes and a truly unique combination of Finnish and Chinese culture, the output is more a vegetable soup than meat and potatoes; you know it is good for you, but a bit boring. While it does clean up towards the end, it feels like some scenes were cut, scenes that would explain things in a more coherent way. Unfortunately, some of the dialogue is quite ambitious too, making you feel you are watching a fragile art movie, which this film is not at all. And what is the yellow plastic duck doing there? That aside, in pure visual terms the film offers some good action choreography, although most of it on a small scale. Costumes, sets and locations seem well designed, as does the general cinematography. Not as bright as some Chinese action films like Hero or House of Flying Daggers, but in that direction, linking the film more to big-budget wuxia films that any other Nordic film ever. Made on a small budget, it’s quite amazing how they managed to create so many sets and props, not to mention action scenes never before seen in a Nordic film. Other aspects such as acting (by Tommi Eronen, Markku Peltola, Jingchu Zhang, Krista Kosonen, Hao Dang, Taisheng Chen and others), music and special effects (of which some are digital) also work well. There is no question of the competency of the director, but while each individual part of the film demands acclaim, the overall result leaves something to be desired. The film is clearly unique in a Finnish context, and that’s not only for its Chinese half. Finland has perhaps the least tradition of all Nordic countries when it comes to fantasy films, so combining their own mythology with Eastern legends feels interesting and fresh. Jade Warrior might be the best film you’ll ever see from Finland, although that says more about Finnish films in general than this one in particular.